If you ask most people what a birth star is, almost certainly he/she will relate it somehow to astrology. The thought makes me cringe. Although there really is no such thing as a birth star, there is such a thing as a star whose distance from Earth is equivalent in light-years to the day you were born. That means the light leaving the star actually began radiating in the direction of Earth within a few months of the day you were born. For instance, I was born on August 18, 1958, which was 54.5 years ago. All that's needed to find my birthday star is to find one that is 54.5 light-years away. Fortunately, there's an app for that. "Your birthday star is in the constellation Taurus. It is called 39 Tauri in the Historia Cœlestis Britannica of John Flamsteed and Edmund Halley. It is called NS 0405+2200 in the NStars database. It has visual magnitude 5.9 meaning that you could just see this star with the naked eye under the best viewing conditions. It is marked in the center of this star chart, at celestial coordinates (J2000 equinox): Right ascension = 4:5:20.3, Declination = 22:0:32.1 This star is 54.5 light years away, which means that the light we see from it today set off on its journey at about the same time that you were born. Come back in a month or two and your birthday star may change, as the light from more distant stars reaches Earth." 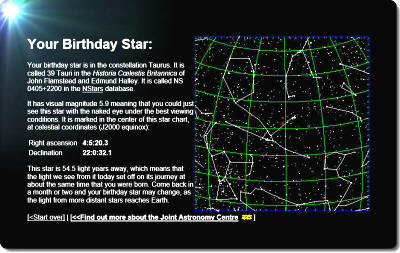 That's real nice to know; however, your (and my) birthday star changes all the time. If I was to re-run the birthday star finder a year from now, my star would be different because the current equivalent distance would be a light-year farther away. In fact, the new star would be τ01 (Tau01) Hydrae in the constellation Hydra.